Passenger lists provide genealogists with key information about an ancestor's arrival in the New World. Once located, these records can help us learn about his or her foreign and "Americanized names, as well as potentially assist with determining an immigrant's place of origin, which in turn, can lead us to records housed in repositories and other locations "across the ocean." But if you take the time to really examine these lists, you can often uncover additional hidden clues to give you more of the story. Keep in mind that the amount of information that is available on passenger lists will largely depend on the time period of the emigration and applicable government requirements. For example, Customs Passenger Lists (1820-1891) typically only included "bare bones" information such as a Passenger's name, age, gender, occupation, and nationality. Post -1892 "Immigration Passenger Lists include the same information found on the earlier lists, but may also provide such details Marital status, last town of residence, final destination in the United States (often including name of relative or friend), whether the passenger could read and write, amount of money the passenger was carrying, the passenger's state of health, Race (from 1903), place of birth (from 1906), personal description (from 1906), and name and address of nearest friend or relative in the old country (from 1907). Remember, however, there can be exceptions to every rule, and that information is not always 100% accurate even on "official" records. So, when you do locate a passenger list for your immigrant ancestor, look carefully to see if you can spot additional details that come in the form of special markings or notations, such as the following. Naturalization Numbers: You may see a series of numbers on a passenger record over or above your ancestor's name and possibly a date. This is a pretty good indication he or she filed to become a citizen. The notations were added to the passenger record as part of the verification process to show the applicant emigrated as they had stated. These notations can provide clues for you to search for your ancestor's naturalization paperwork (especially the petition for naturalization and the declaration of intention--also commonly referred to as "first papers"). Such naturalization documents can provide valuable clues about your ancestor including his or her date and place of birth, address, occupation, marital status (spouse's name & birth date), names, dates, places of birth & residence of applicant's children, date when US residence commenced, length of residence and a personal description. It certainly helps to have an idea of where an individual was living on the date indicated. My maternal grandmother's 1922 arrival record included a number (6-80275) and a verification date (e.g. 12/27/39) written in above her name (see the edited image). I could use the beginning number "6"to track down her petition for naturalization in Pittsburgh, Pennsylvania (the copy of her petition has this number). Click here for a page listing the District Key Number Tables by date (1926-29; 1929-33; 1933-43). Note: there was no Certificate of Arrival requirement for immigrants who arrived prior to 1906; however you may come across naturalization verification activity associated with some pre-1906 lists. "X" Marks the Spot: Beginning about 1903, the passenger arrival lists began to include a supplemental section for detainees. Many immigrants were detained for short periods of time at the port of arrival until relatives came to claim them. This especially applied to unescorted women, regardless if children accompanied them. A woman may have been held until her husband or other relative was able to come collect her, or at least until a response was received to a telegram informing the husband or relative of her arrival. Once it was confirmed that someone would be expecting her, the woman could be released to catch the rail to her final destination. If you see an "X" to the far left of the page on the passenger list, before or in the name column, this usually signifies that the passenger was temporarily detained. Detainee Lists, or Records of Detained Aliens that have survived were microfilmed with their corresponding passenger lists. Look at the end of the manifest for a particular ship to see the list of all detained aliens. When you get to this page, look at the information in the left columns. Included are the immigrant's name and a reference to the group (page) and line number where his or her passenger list record is found. Any other passengers who were dependents of the detained immigrant would also be held, so check the two additional columns that show the number of immigrants, by age, detained with the principal passenger. The "Cause of Detention" could have marks indicating any number of reasons the immigrant was held, including: hospitalization, "hus," or "b-i-l" (meaning waiting for a husband or brother-in-law to come meet the immigrant), Tel $ (meaning lack of tickets and a telegram had to be sent to a relative for them to send money). In the "Disposition" column, you'll see the name and address of the person to whom the immigrant was released, even if that person is at a distant address. If the initials "R.R.," are included in front, it means the passenger was sent forward via rail, or perhaps you'll see the name of an immigrant aid society listed (e.g. "Irish Home", "Hebrew Society", etc.). These societies often took responsibility for women or children traveling alone and would ensure the immigrant's safe arrival at the proper destination. If you see a time noted at top or elsewhere in the "Cause" column, this indicates the time of day when the immigrant was detained. 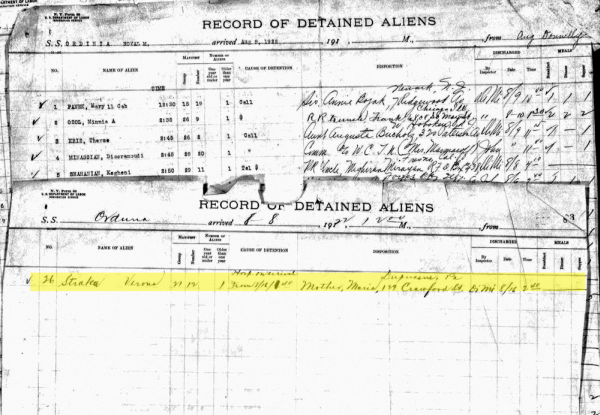 On the right-hand side, you'll see a "Discharged" column showing the name or initials of the immigrant inspector who released the immigrant (this aided in the capturing of administrative data to be used by the government). The "Meals" column shows the number of breakfasts, lunches, and dinners consumed by each detained immigrant. Since the steamship companies were responsible for the detention expenses of any excludable immigrant they brought to U.S. ports, the data in this column was used to compute the monthly bills sent to the companies. If the passenger was deported, you may see such abbreviations as "LPC" ("likely public charge") and "LCD" ("loathsome contagious disease"). My grandmother, Verona Straka, was detained at Ellis Island (hospitalized upon arrival) and there is a stamped note "Hospital Discharged" by her name on the list. I was able to locate her on the "Record of Detained Aliens" for the Orduna, arriving in New York on 7 August 1922. Perhaps you had an ancestor who was born in the United States or became citizens, but for any of number of reasons traveled back to his or her homeland. Remember, not all immigrants intended to stay in the US permanently. Some were so-called "Birds of Passage" who came to over to earn enough money so they could eventually return to their ancestral town or village--many with the goal of purchasing land back home. But these immigrants may have had children during a stay in the US. By law, persons born in the United States are US citizens (unless they later expatriated themselves), and therefore entitled to admission to their homeland. Look for the annotation "USB" or "US Born" or "Born in USA". It's common to see this for children returning home after a visit abroad with their foreign-born parents. A "US Birth" notation explains that the children are citizens, but may be listed with their parents on a "List of Alien Passengers", and usually not inspected under the same process as non-citizens. My paternal grandmother's sister, Anna Bavolar, (see the cropped record shown below) was born in the United States during the time her parents lived in Freeland, Pennsylvania. The family returned to Slovakia and Anna later immigrated to the US on her own in 1911, but went back to Slovakia in 1917 to care for her ailing mother, and then returned to the US in 1920. The notation on her 1920 passenger list shows, "Claims US Born". Her daughter, Anna, also has the same notation. Keep your eyes out for other markings and notations in columns such as occupation, additional verification of arrivals, list of aliens held for special inquiry, cross references, and other columns. For a complete guide, see Guide to Interpreting Passenger List Annotations by Marian L Smith. There may be more to your immigrant's arrival record than you see upon first glance. It often helps to extract the data onto a clean form that you can work with on your own. Blank forms such as Copy of Manifest Extract Forms by Cavaliere Anthonl Lascio (1933-2004), and Passenger Arrival Log: Ellis Island Genealogy Learning Center - Charts & Forms are quite useful for this purpose. You should carefully examine the passenger list and copy down any notations you discover. Remember, in genealogy, finding one record is not an end. Rather, it's usually a springboard to another record, or document your ancestor left behind.